Shifting Paradigm Records is proud to announce the October 5th release of Mestizo, the new album from bassist and composer Evan Salvacion Levine. 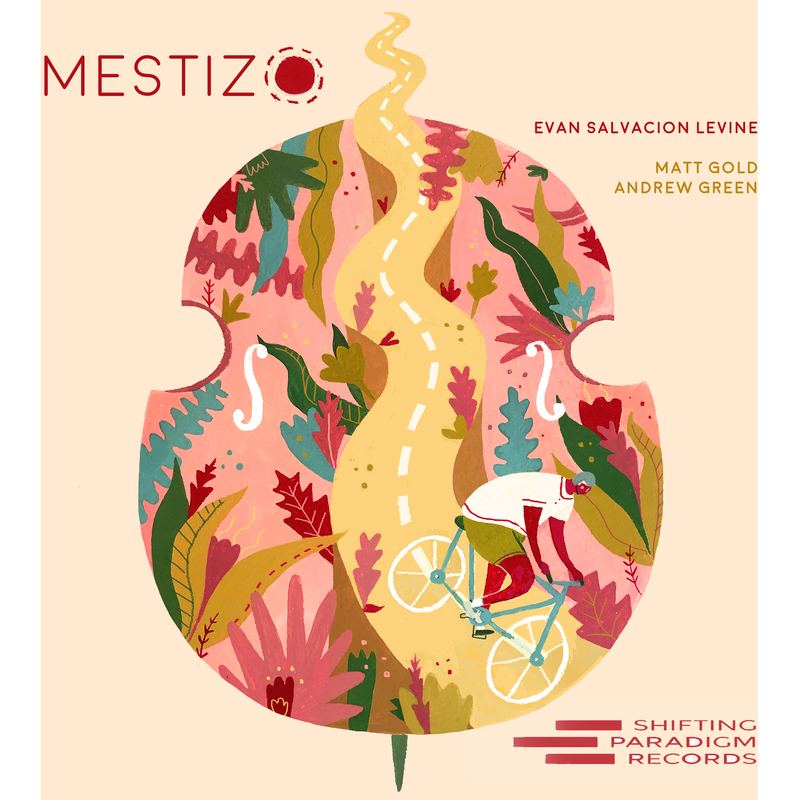 Mestizo, Levine’s sophomore release as a leader, debuts his new trio project, which features Matt Gold on guitar and Andrew Green on drums. This seven-track collection of originals – each penned by the Chicago-based musician – celebrates both his musical and cultural identity. By intertwining both, Levine has developed himself into a musician who, from the get-go, displays an open and accepting approach to varying and dynamic musical opportunities. While the title track attempts to represent Levine’s wide-spanning cultural upbringing through rhythmic inflections, “Little Shells” is a reflection upon the sounds and rhythms present on water – specifically the water of the Atlantic ocean which Levine lived close to in Miami, before moving to Chicago. Waves crashing on the water are always happening in different intervals, at different spots and create something more complicated than meets the eye. The combination of the brass bells, guitar and bass on this track weave something that is relaxing in sound, yet at the same time retains a certain complexity. “The Best Things Never Change” evokes a real feeling of nostalgia for Levine. With a slow, bittersweet melody, this track recalls a reunion with an old friend and highlights the fact that even though both have grown older, the intangible things that blossomed the friendship in the first place remains. Another stand-out track from the album is “Highways” – a fun song about road trips! With a groove that pays homage to Ahmad Jamal’s “Poinciana”, Levine wrote this track on the road while moving from Miami to Chicago. Evan Salvacion is an Upright/Electric Bassist, Composer, Guitarist and Educator that currently lives in Chicago, IL. Originally from New Jersey, Evan’s musical career began at a young age. Evan received his Bachelors degree in Jazz Bass Performance from Oberlin Conservatory in 2014 and his Masters Degree in Music Improvisation from the University of Michigan in 2015. After graduating, he was a prominent figure in the Miami Jazz scene before moving to Chicago in 2017. Evan has performed with Michelle Coltrane, Nicole Yarling, Tal Cohen, Jamey Haddad, Benny Green, Carl Allen, Kendrick Scott, Patrick Donley, David Leon, Alex Brown, Sean Jelenik, Bonzo Squad, Benny Golson, Ellen Rowe, Nicole New, Lex Korten, Matt Gold, Andrew Green and many others. As part of the Oberlin Jazz Outreach program in 2014, Evan was part of a trio that toured across Italy. Evan’s first album, Unsolvable Problems, was released in 2016 and featured Lex Korten on Piano and Kayvon Gordon on Drums. It featured almost all compositions by Evan and toured throughout the East Coast and Midwest. More recently, Evan has played at the South Bend Jazz Festival in 2017 with Michelle Coltrane and Hendri Lamiri’s groups. Evan is currently a part of Helios, which was featured as a part of Chicago’s, Night out in the Parks program and performed at public parks across Chicago in June. Evan is also a member of Echoes, which will be touring in Carson City, San Francisco and Los Angeles in August. Echoes will also be releasing their sophomore album this summer. Evan has also recorded music with Tommy Carroll, Russell Davis and many others. Evan has a new trio project featuring Matt Gold (Sun Speak) and Andrew Green (Twin Talk). This album, entitled Mestizo, features Evan’s compositions and will be available in October 2018.